Two very different but completely delightful stories in the fantasy genre. Both series in this volume are going to wow the yr 5/6's as well as introduce them to some extraordinary characters, writing and vocab. They will also hopefully take to it because they've already seen some of the tv series. For the past few years, on a cozy fall day, Ben and I would light a few scented candles, grab a couple hot drinks and snuggle under a heated blanket while watching Over the Garden Wall. It's a tradition now, one of my favorite nights of the year. We love everything about the series: the humor, the old-timey music, art and characters. It was always sad to remember that there's only one season. That's why I was thrilled to find out that the series continued with graphic novels. I was scrolling through Amazon the moment Ben told me about them.The writing in the first story about Greg was perfect, it felt as if I was watching a normal funny episode. The next story was more serious, it focused on the Woodsman's lost daughter, Anna. Anna is in complete isolation. She doesn't dare to venture far so she searches for her father every day at the top of her roof, looking through a telescope. There were some repeated pages, I didn't know whether it was intentional to show her descent into madness or a misprint. Overall, I'm excited for more. I picked this comic up, because it was recommended to me and I loved the original TV mini-series. This is definitely a starter and it doesn't have as much depth or intrigue as the mini-series. There are 2 mini-stories within this first issue. One with Greg that is cute and another melancholy introduction into the life of the Woodsman's daughter, Anna.The art is beautiful and well done, and as a fan you're just happy to see more of the series! It's just not as action-packed or as captivating as the original TV series. Hopefully, it only gets better from here! pretttyyyyyyyysuper fun to read when a big fan of the show ! !though the story was not as amazing as hoped and the Anna storyline was nice but I think it should have been a separate book. It's already a year yet I still miss this amazing short animation series. Reading the first four issues was really awesome when I learned new comics I was super thrilled. Only this time the story focuses on Greg and the Woodsman's daughter during his time away in their cabin. I love the show, and this does it justice and service. 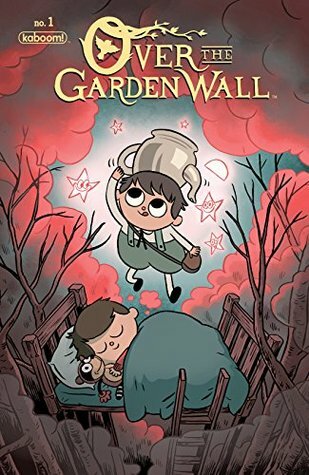 If you love the tv miniseries Over The Garden Wall (and it is fabulous!!) then you will probably loving these continuing adventures of Wirt and Greg. Jim Campbell Amalia Levari Cara McGee - Librarian Note: There is more than one author in the Goodreads database with this name.Show Creator of Over the Garden Wall who worked on Adventure Time. Illustrator Jim Campbell was the show story boarder for Over The Garden Wall.